NEW Lake St Clair No Secrets Volume 4! PLUS Volume 3 back in Stock!! Great News for anyone who wants MORE information on Bass Fishing Lake St. Clair!! Captain Wayne Carpenter's NEW No Secrets on Lake St. Clair Volume 4 is HERE!! 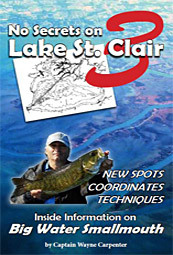 The latest in Wayne's great line of Lake St. Clair and Smallmouth Bass Fishing books is a must have for anyone who wants to know as much as possible about our NEW Lake St. Clair! As anyone fishing out there knows it was a NEW lake again this 2017 season! Possibly more so than any other season since I've been fishing out there way back to the 1980s!! Plus, the water is very high again adding to the changes. All of this is covered with much MORE in Wayne's later book - No Secrets on Lake St. Clair Volume 4!! More great news for those of you who have been looking and asking - No Secrets on Lake St. Clair Volume 3 is BACK IN STOCK!! Don't wait - there are only so many copies of these books available and they sell fast! Get Your's Now!! Re: NEW Lake St Clair No Secrets Volume 4! PLUS Volume 3 back in Stock!! More on No Secrets on Lake St. Clair VOLUME 4!! Two key interviews are included. One with DNR Fisheries Biologist Todd Wills, from the Lake St. Clair Fisheries Research Station. Todd brings us insights into the bass population with data and information from research time on the water. Another new addition to the No Secrets series is an interview with Bill Panagos (UAWBigDog). Bill is a lab researcher by day and avid fisherman who has delved into the world of research on how rattles affect bass. He provides us with hard data that can help us understand the impact that rattles have on our catch, and how to use them. Capt. Wayne Carpenter continues on his quest to give anglers the best possible bass fishing data, and a path to successful fishing on Lake St. Clair. Information on “Bite Patterns” can put you on a smallmouth bite all day long irrespective of season, structure or location on the Lake. Find out how to manage the new water levels or how to locate bass fishing spots in the St. Clair River system. Take a ride with Capt. Wayne through the “Bass 360™” method of eliminating irrelevant data, and getting directly to the information that will put the next bass in the boat. Finally, a groundbreaking chapter on using largemouth bass fishing tactics for smallmouth bass will benefit any angler who is new to Lake St. Clair and smallmouth fishing. Once you read this chapter, you will be amazed at how easy it is to catch smallmouth with well-established largemouth methods. Already convinced?!? 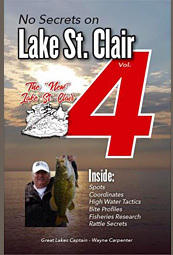 Buy No Secrets on Lake St. Clair Volume 4 Now! !